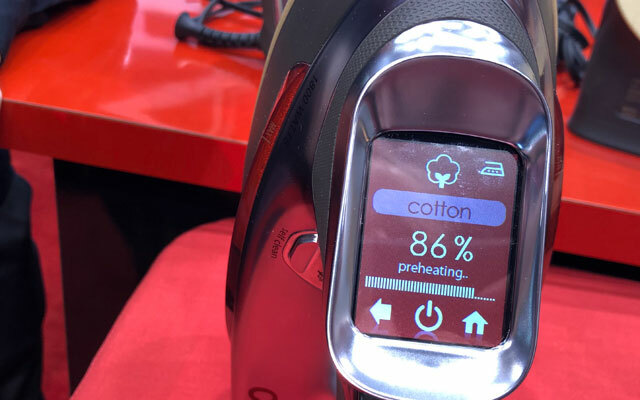 What’s hot in household gadgets for 2019? 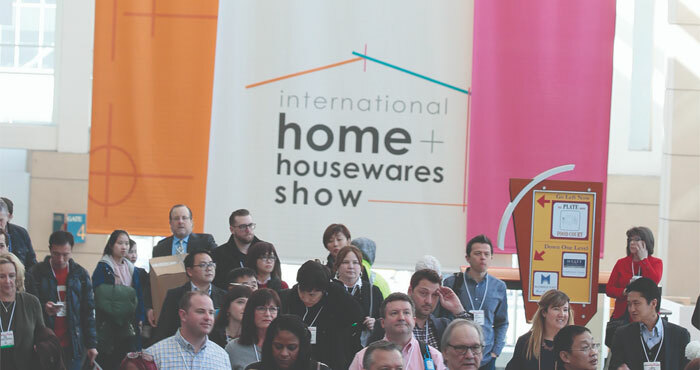 I attended the International Home and Housewares Show in Chicago, which showcases products from 2,200 exhibitors, to find out. After spending countless hours scouring the show floor, I found 15 products I’d gladly make room for. Chefman Smart MultiCooker with WiFi: Have trouble following cookbook instructions? Prone to just throwing in “a handful of this” and “a pinch of that”? 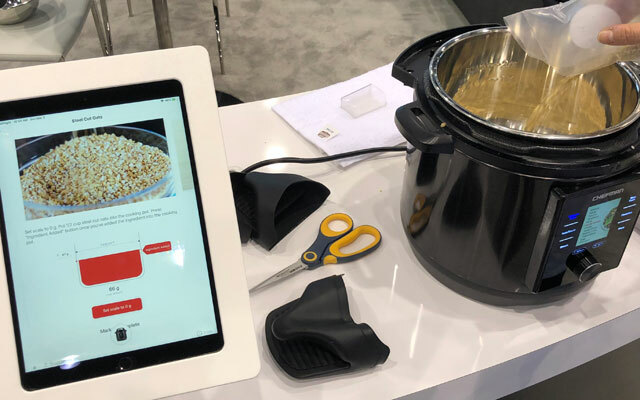 You’ll love Chefman’s smart multicooker with guided cooking to “eliminate the pain parts.” Pick a recipe (about 100 will be available at launch) on the companion Chef IQ app on your smartphone or tablet. Next tick the boxes customizing how you like the food to come out – say, with chicken that’s super juicy, not so moist or falling off the bone. Seasoned mild, medium or extra spicy. Now start adding ingredients, one step at a time, as coached on the video screen. 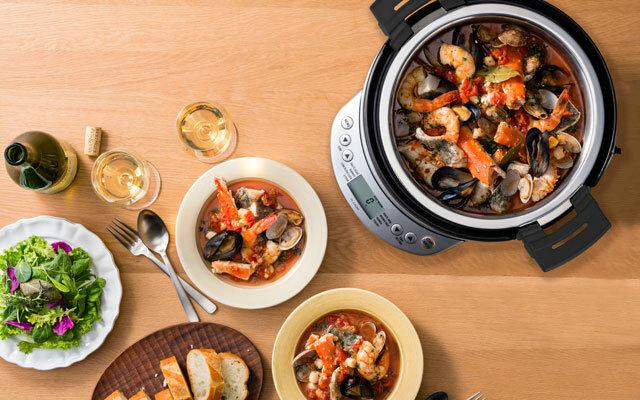 The multicooker’s built-in scale tells you when to stop. Overdo it on, say, the protein, and the recipe auto-adjusts the quantity of the other ingredients to achieve a consistent result. Cooking options include pressure cooking (with automatic/safe release functionality), slow cooking, sauteing and steaming. There’s even a disinfecting setting. Worth the $199 price if Chefman’s “can’t spoil-the-broth” promise holds true! Ready “end of June or July” 2019, according to Chefman. 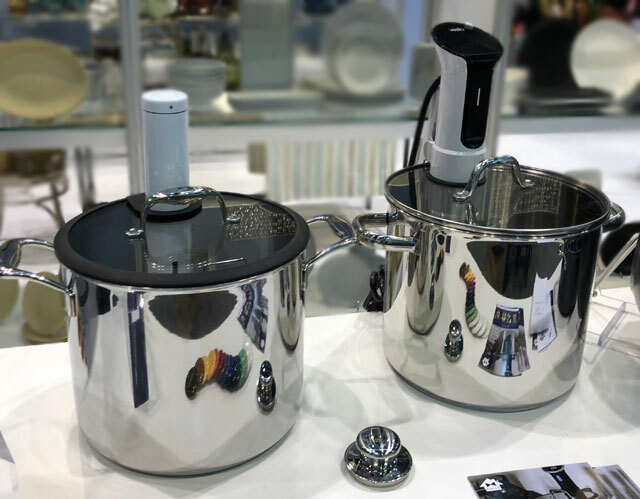 Gourmia Smart Chill MultiCooker (left) and Smart Chill Pressure Cooker (right): Some folks put food that’s frozen into a slow cooker in the morning, setting the timer to start cooking at 1 or 2PM in the afternoon. 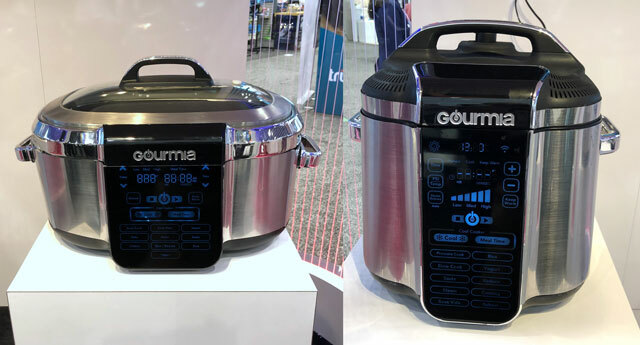 But for food safety sake, we think Gourmia is onto a better method with its new 11-function-in-1, 6.5-quart capacity Smart Chill Multicooker and 6-quart Smart Chill Pressure Cooker. Both countertop appliances feature an onboard refrigeration unit that keeps fresh food optimally chilled in the 35-42 degree Fahrenheit range, until the preset timer triggers “start cooking now” and the mechanism shifts into heat mode. As these cookers are Wi-Fi- enabled, you can adjust the timing of programmed operations from afar. 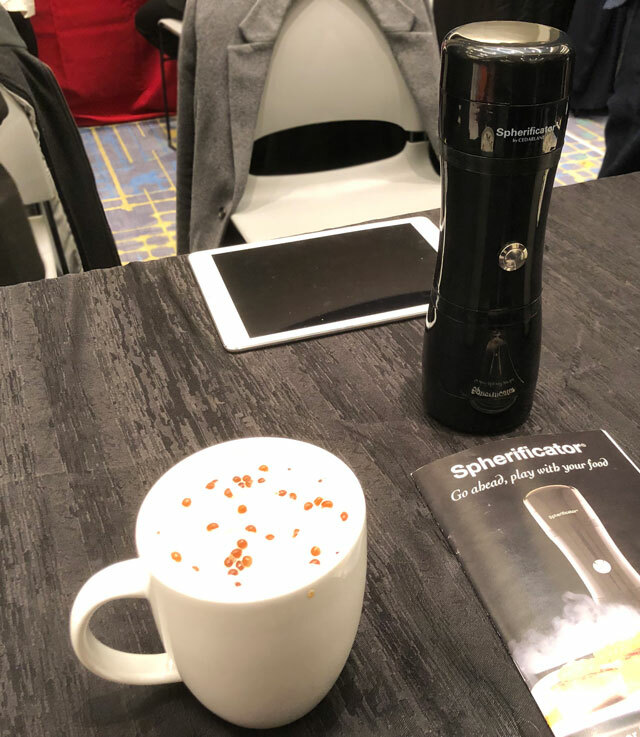 Gourmia first showed a chillin’ multicooker prototype at last year’s IH+H show – but chief designer Benny Itzkowitz says shrinking the thermoelectric “Peltier effect” technology and shaving manufacturing costs took longer than expected. The products are now expected to make it to market mid-year 2019 , each priced at $199. Best known for pioneering smart rice cookers, Zojirushi is aiming high end with a posh new multicooker (EL-CAC60). Upscales the species with a heavy, multi-ply stainless steel (with aluminum core) pot for even and nonstick cooking, a unique self-standing tempered-glass lid and an ergonomic horizontal control panel. On the cooking side, the EL-CAC60 has an impressively wide range of heating temperatures that starts at a very low 140 and goes up to 200 degrees Fahrenheit. Plus, you can sear meat at 410 degrees to get your stew going before moving to slow-cooking. 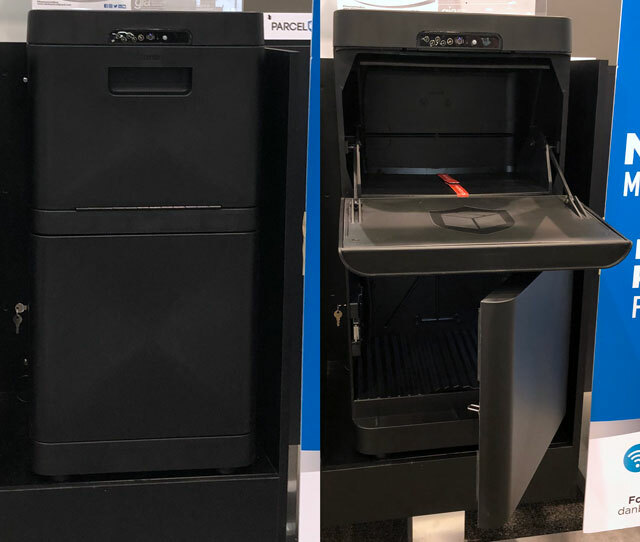 We like the vertical styling of the Cuisinart AirFryer Toaster Oven line (first seen at their IH+H booth last year and widely design aped by rivals at the 2019 show.) 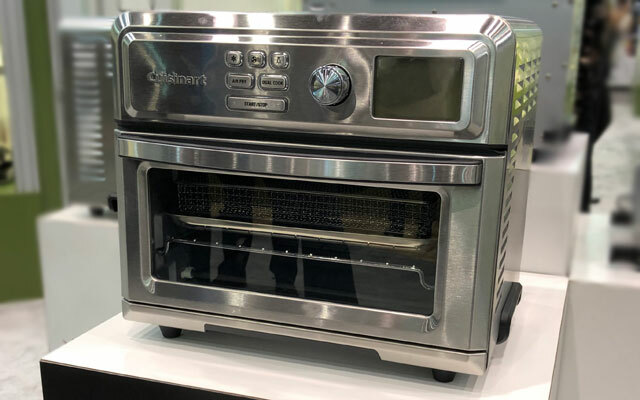 Cuisinart’s new digital-screen, one-dial TOA-65 ($269.95) accommodates up to three pounds of food for air frying, tackles proofing dough, dehydrating protein and veggies, and, of course, performs the old reliable tasks of baking, roasting, and broiling. Temperature setting options are unusually flexible for the species, from a high of 450 degrees Fahrenheit down to 80 degrees, which is useful for dough proofing and dehydrating. Parcel Guard by Danby: Are home deliveries going missing when you’re not home? Parcel Guard is a tall, smart mailbox that thwarts the thieves. 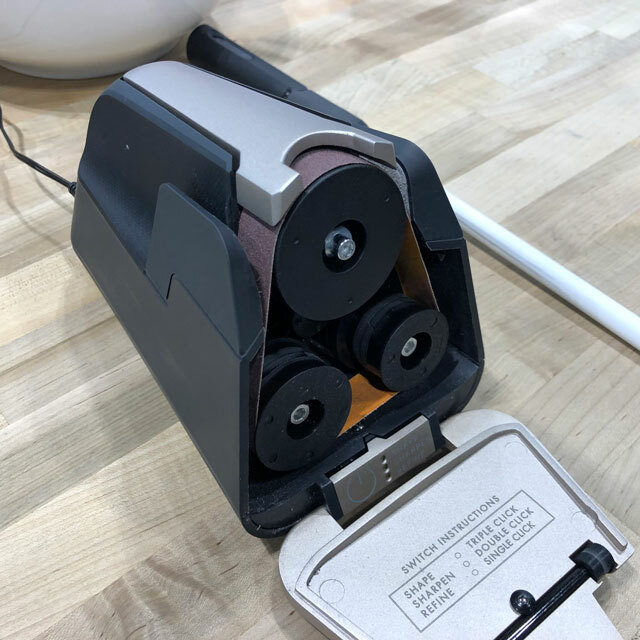 Armed with sensors, an IP camera, and internet connectivity, this thing takes a picture and sends an alert to your phone whenever someone stuffs a package into the big mouth door at the top. The shipment slides down into a lower rubber cushioned compartment which can then be opened with a key or scanned UPC code on an iOS or Android device. A loud alarm goes off if someone jostles or attempts to move the structural web plastic box – which can be bolted down or bulked up to about 90 pounds with sandbags laid in the bottom. 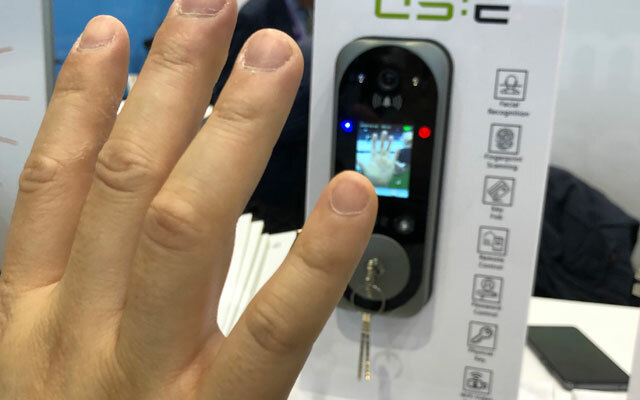 US:E Smart Door Lock: A latecomer to the smart home lock category, the US:E Door Lock turns that lag to advantage with a fuller array of features. It responds to sophisticated 3-D face recognition, fingerprint verification, and even palm print scanning. Likewise, it unlocks with a special card fob, a password, mobile phone app or a conventional key. The onboard 1080p camera (illuminated with twin night lights) sends a picture of a visitor to your smartphone whenever someone hovers or the integrated doorbell is rung. Features “financial level safety” lock cylinder and security chip. EyeTemp: Have forgetful folks under your roof? Avoid accidents by placing this low-cost smart sensor near appliances like a stove or space heater. 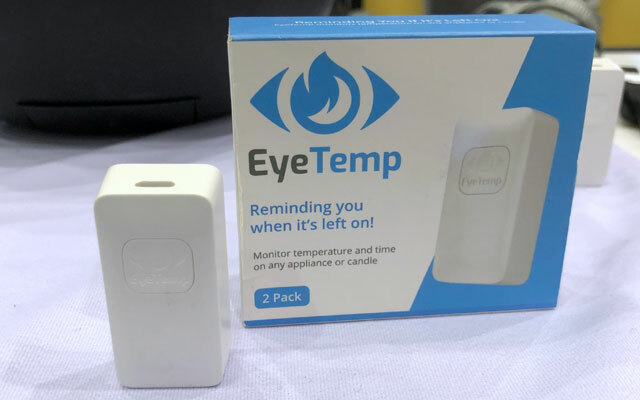 EyeTemp sends out an alert to your mobile phone when sensing an appliance has been left on too long, or (using geofencing) if you’ve left the residence without shutting off the product. If the prime user doesn’t respond to the alert, EyeTemp then notifies an emergency contact. Spherificator by Cedarlane: Dress up drinks and food recipes with this nifty taste enhancer. The Spherificator turns liquified fruits and vegetables (melon, salsa, ginger, lemon, coconut, etc) into caviar shaped spheres you then use as garnish. It doesn’t work with “gloppy” tapioca, though, for Bubble Tea. Kuvings SV-500 All Natural Vacuum Blender: Drink to your health with this new generation blender. Removes oxygen from the liquifying fruits and veggies to prevent oxidation, maintain nutritional value, taste. color and freshness. 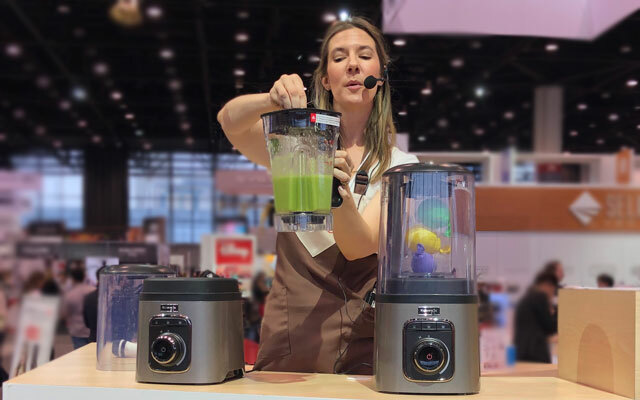 “There are other blenders on the show floor that do vacuum extraction, but ours Is quieter – with a special noise cover shield – and more robust, backed with a seven-year warranty,” said our smoothie server. CHI Touchscreen Iron and Reliable Velocity 260IR Iron: The Reliable Velocity 260IR and CHI Touchscreen Clothing Iron both feature a digital control panel which offers automatic ironing programs. One touch sets the correct temperature and steam output to remove wrinkles and apply the perfect press to the garment on the table. The Reliable stands apart with its Dual Vapor Generator technology, heating water internally so it turns to steam before reaching the soleplate (also heated). That prevents spitting or leaking. The premiere CHI branded model uses the same titanium-infused ceramic soleplate tech that powers the brand’s super popular G2 Flat Iron for hair. The plate is scratch resistant and non-stick for ultra-smooth operation. Work Sharp Culinary ESNH Electric Knife Sharpener: Been warned that overdoing the sharpening can ruin your knives? One Touch Programing here eliminates the guesswork and with pre-programmed cycles. The ESNH Electric sharpens knives just the way they’re made with flexible abrasive belts (good for 100 honings, spares included.) An integrated vacuum system magnetically grabs the metallic dust for disposal. Foodcycler: You can throw almost all kitchen scraps (even smaller meat bones) into this grinding, heating, and air-circulating pulverizer and watch it turn the gunk into natural, organic, dry fertilizer in three hours. Special carbon filters naturally block stinky food smells. 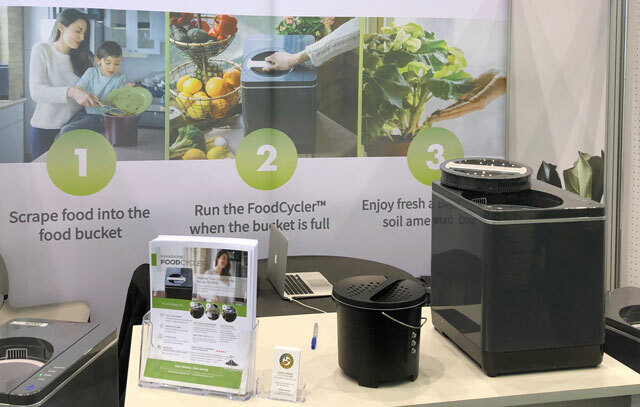 Creates 54% less CO2 than a regular backyard composter. Tuxton Home Sous Vide Pots: Tuxton’s 9.8-quart tri-ply stainless steel stock pots have a round opening in the glass lid to perfectly support a Sous Vide immersion cooking wand , like the Anova ($159 on AnovaCulinary, check price on Amazon). The silicon-ringed opening is also good for releasing steam, adding ingredients or tasting and stirring contents with a long-handled spoon. The hole plugs up for conventional cooking with a stainless steel stopper. 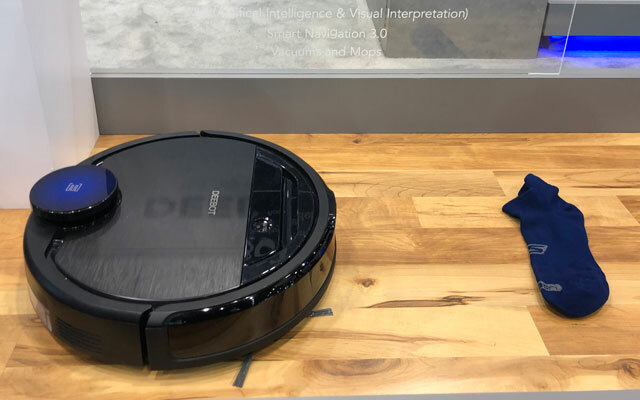 Ecovacs Deebot Ozmo 960: Ecovac’s newest robot vacuum/mop introduces AIVI (artificial intelligence and visual interpretation) technology to recognize and work around household objects lying on the floor - cables, shoes, socks and charging docks. So users don’t have to pick up that stuff prior to cleaning.